ISITING THE Barney Creek site where the Spurlings’ mill once stood inspires awe at what God has done since the birth of the Church of God on August 19, 1886. Some aspects of life along the rambling creek in Monroe County, Tennessee, remain the same 125 years later. Water rapidly rushes over rocks smoothed by centuries of wear. The vegetation is lush, and the rugged terrain continues to be remote and difficult to traverse. Few economic opportunities exist for people living in the region. Yet from that secluded setting, God raised up a movement that now testifies of almost 7 million members and over 34,000 churches in 181 countries. The Church of God began with the ministry of Richard Green (“R.G.”) Spurling and his father, Richard Spurling. 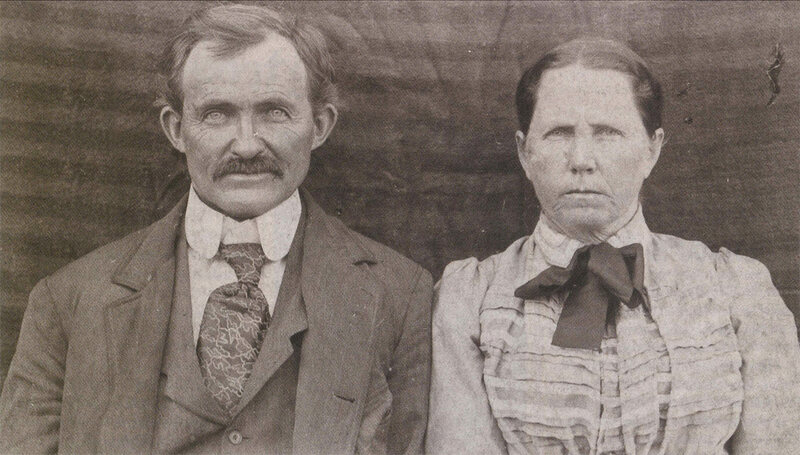 Both were Baptist ministers living in the Unicoi Mountains of east Tennessee, where they bought adjoining property along Barney Creek in 1882. R. G. Spurling was a licensed minister with the nearby Pleasant Hill Baptist Church in Cherokee County, North Carolina. His father was an ordained elder and member of the Holly Springs Baptist Church near Tellico Plains, Tennessee. They also built and operated grist and lumber mills. R. G. Spurling experienced growing discord with the Landmark Baptist movement that dominated congregations in their area, however. He increasingly desired fellowship with Christians outside the Baptist tradition. Believing that human creeds were fallible and too often led to unnecessary divisions among Christians, he emphasized the New Testament over creedal statements and Baptist traditions. Using the language of the railroad, R. G. Spurling described the biblical commands to love God and neighbor as two golden rails along which God’s church should travel. He insisted that the Landmark Baptist movement had followed the widespread practice of replacing the golden rails of love with the narrow rails of human creeds and traditions. As a result, they had hindered Christ’s prayer for Christian unity by excluding those who did not fit within their understanding of the Church. Eight persons responded to the young Spurling’s call for reformation, including his father, Richard. Having the authority of an ordained elder, Richard then moderated a business meeting to establish a local congregation named “Christian Union.” Once established, the Christian Union called R.G. as their pastor, and Richard ordained his son to the office of bishop on September 2. Now 125 years later, the character, commitments, and mission of those founding members remain foundational for the Church of God. First, they were people of “the Book.” They believed the New Testament contained the doctrine and practice necessary for the church at all times. Second, they valued every member. They recognized “equal rights and privilege” to interpret the Bible and expected Spirit-led members to have insight into the Word of God that is of value to the congregation. Third, they committed themselves to Christian community. By sitting together they did not promote their individual interpretations over the discernment of the Spirit-led church. When differences inevitably emerged, their covenant with one another created an opportunity for love and spiritual discernment to nurture unity. Fourth, they desired to be the Church of God. They embraced the responsibility to search the Scriptures together for the purpose of discerning a New Testament model of being God’s church. They dedicated themselves to an ongoing mission rather than a declaration that they had already achieved such restoration. Finally, they lived out the Great Commission. This is evident in their walk more than in their talk. R. G. Spurling soon planted other congregations on Pine Ridge and Paul’s Mountain in Monroe County as well as one in Polk County, where he later settled. He also encouraged W. F. Bryant and those associated with the Shearer Schoolhouse revival in North Carolina to organize as a local church. Although a local church was no longer located at the Barney Creek mill site after the Spurling family sold that property in 1889, the spirit of Christian Union infused the congregations established in the coming years. 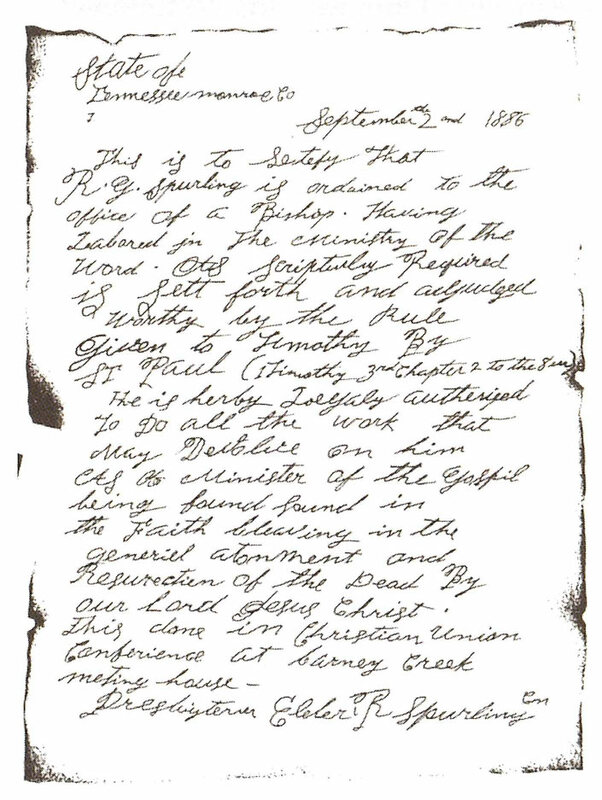 Richard went to be with the Lord in 1891, but R.G. continued the work. Able ministers such as W. F. Bryant and A. J. Tomlinson, along with countless laity, joined this vision to restore God’s church. As Barney Creek continues to flow 125 years later, we continue to sit together as the Church of God. David G. Roebuck, Ph.D., is the Church of God historian and director of the Pentecostal Resource Center in Cleveland, Tennessee.